I bet you have seen a lot of women with blonde under black hair style. 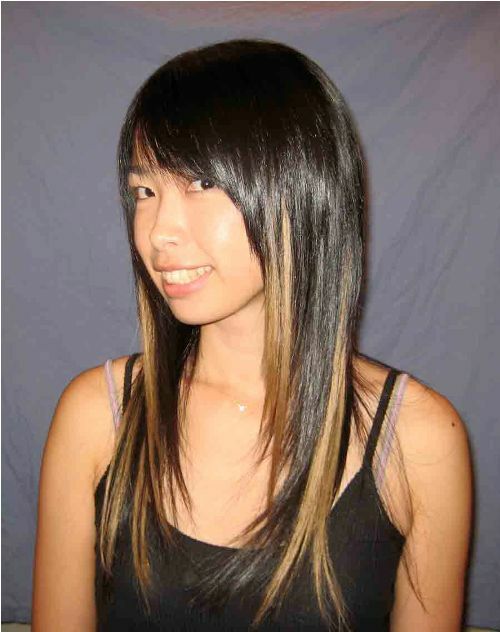 This hairstyle is very popular these days. For those who have not seen this style before, just open some fashion magazines or surf the internet, you will be amazed of how this unique hairstyle can offer flirty and funky look. When it is done well, the blonde at the upper part can perfectly against the natural black hair. You can actually easily have your hair done in blonde underneath style in many salons. But some women may be eager to be challenged on coloring the hair their own. If you want to do this on your own, the very first thing to do is to decide how deep the blonde is. It can be only at the crown or extends to the half length of your hair. First, go to a beauty supply store to buy a bleach kit. Depending on how dark or light the blonde is, pay attention to the number of the package. The higher the number, the color is lighter. You need to bleach the area where you want to color with blonde. Start from the crown down to the desired length. If you have very dark natural hair, it may take up until two or three process. Before you bleach the hair, apply conditioner and vitamin to prevent the beach from damaging your hair. Bear in mind that bleach is so harsh that it can destroy your hair. Comb you hair. Then mark the area where you want the blonde to stop. You can tie the lower hair using elastic rubber so this portion is out of the way. The most difficult step in coloring blonde under black hair is when applying the bleach. Don’t forget to protect your hands with gloves. As mentioned before, bleach is harsh that can create allergic reaction to sensitive skin. Set a timer as instructed in the bleach kit indication. After that, wash your hair using cold water. Hot water will wash out the bleach. Let the hair dry naturally. Now, look at the mirror. Now, you have beautiful and chic blonde under black hair. Although you have finished coloring the hair, you should take care of it forever. That’s the consequence when we decide to color our hair. Use hair products for colored-treated hair. If possible, stay away from flat ironing or blow drying.